Ever turn into a parking garage only to be confused about the flow of traffic, and where all the empty spots are? Ever think you found a great spot, only to find a Mini Cooper tucked into the spot you thought was empty? Not if you’re in the Cosmopolitan Hotel and Casino in Las Vegas. When you turn the corner, illuminated signs tell you how many empty spaces there are down each aisle. That’s pretty helpful. I hate turning down an aisle and finding nowhere to park at all. 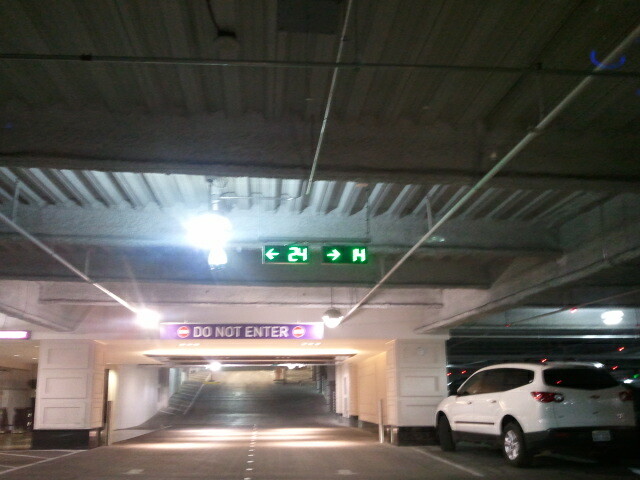 Once you turn, lights on the ceiling above each space tell you whether or not a car is parked there. Eliminates all need to hunt for a space and guess if there is one a little closer or not. Simply pick the green light you like, drive there, and park. The lights are pretty fast too. I pulled out of the spot, turned into the aisle, and looked in my rear view mirror to see the previously red light had turned green again. Beer has definitely arrived. Whether you call it micro, craft or something else, you can often find more than just Budweiser and Coors when you go out just about anywhere you’d expect to find alcohol. The one place where you almost never have any variety at all is in a catering hall. I’ve been to a lot of weddings in the last couple of years, and excepting ones that weren’t in catering halls, the beer selection is non-existent. Most cases even the hard alcohol isn’t very extensive; I’ve been to places that don’t even have tequila. Beer is often just Budweiser, Bud Light, and/or Coors light. A catering hall’s idea of a broad selection is having bottles of Corona and Heineken. I consider it a coup when I find a place that has something as exotic as Sam Adams Boston Lager. It’s like the halls give no thought at all to providing quality beverages for their guests. This isn’t exclusive to beer, as you often find catering halls serve generic uninteresting food as well. Perhaps because most of their customers are things like weddings and parties that aren’t often repeat business, they’re not as focused on providing an overall awesome experience. Maybe it’s because many times the customers are there to party, dance and celebrate, not to eat and drink. Or maybe we’ve been so trained to not expect a great meal or a good beer that we no longer demand it. You know the type. That guy who is somewhat new to craft beer, and always is talking about it. He asks the waiter “What microbrews due you have?” and often orders the trendiest one. He (or she) berates your choice of beverage, and seems to bask in the superiority of having ‘discovered’ beer. The problem is; he doesn’t really like it. He thinks he’s supposed to like an IPA so he drinks it, but his palate isn’t used to the bitterness. He’ll hear about some new super double IPA and have to have it, not prepared for the intense taste. This guy actually is a disservice to beer, as anyone that is trying to follow him into the world of beer may be turned off by the intense flavors. Real beer is not about intensity, it’s about flavor. There is nothing wrong with enjoying a good wheat beer, or a simple pilsner that’s well crafted. Just like some people will never enjoy 100,000 scoville unit hot wings, some people will never enjoy 100 IBU beers. That’s the transition stage from beer douche to beer geek. But It’s also a good way to figure out what you like. Some people rave about Imperial Stouts. I tend not to like them too much so I don’t order them, even if they’re somewhat trendy. IPAs are acquired tastes, and many people don’t want that much bitterness in their beer. Another problem is that there are a lot of mediocre breweries out there. They’re usually still better than the Bud stuff, but just because a beer is micro doesn’t mean it’s good. So as someone breaking into beer (and I can see it being pretty daunting these days) just trying new things, it’s easy to find stuff that’s not very pleasant. But as you learn what’s delicious, both in general and to yourself, it’s a world of difference. Sixpoint, Troegs, Brooklyn, and Flying Fish are some of the breweries I trust to make high quality beer ‘around’ NYC.